We agree with Pavithra that "cardamom and vanilla are definitely a match made in heaven" which is one reason we are crafting just such an infusion in our First Taste Club. 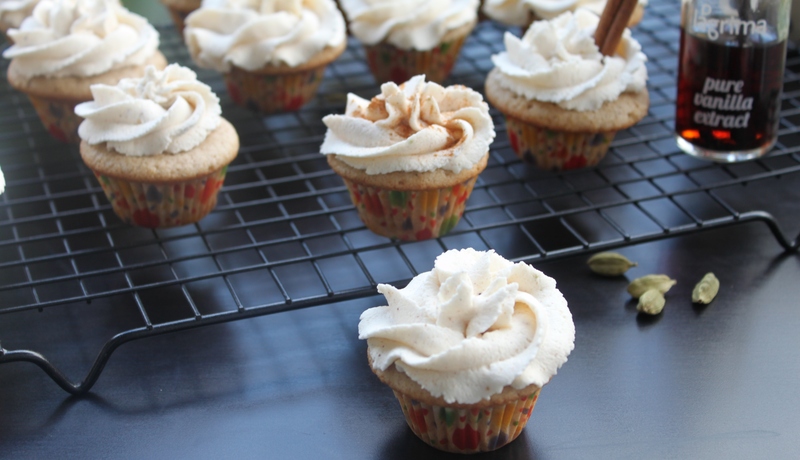 There is just something so wonderful about vanilla and chai and Eat.Live.Burp has captured it perfectly here with her Mini Vanilla Chai Cupcakes. A few things stand out in this recipe: the ingredients and ratios of for your own home-made spiced chai powder, the cupcakes are made with buttermilk and the cream cheese frosting. That's YUM three times! Catherine and Rebekah met at Clark Animal Hospital in St. Louis when they were both kennel attendants -- this is one of those jobs you take so you can apply to veterinary school and have at least one mention of 'experience' on your resume. Fast forward 10 years and a passion for food and animals still thrives. Catherine is now a veterinary nutritionist living in Houston, TX and operates Lenox Veterinary Nutrition Consulting. Thank you Catherine -- we love your cookies! Cream butter until soft, then beat in sugar, egg, vanilla, and cream. Mix dry ingredients together, and stir in. You can roll the dough into a log and chill thoroughly, then cut a piece of dough off the log and roll out on a well-floured cutting board. Cut into shapes desired with cookie cutters. Keep the dough refrigerated until you are ready to roll it out - the dough will roll out better if it stays chilled. Roll dough into balls and press onto cookie sheet - this will make thicker cookies. Bake at 350 degrees F until golden brown - baking time will depend on the oven and the option selected (thinner cookies bake faster). My grandmother's recipe actually doesn't even have a bake time on there - she was like that in the kitchen, she just had a sixth sense for when things were done. Allow the cookies to cool before frosting. Mix ingredients in a mixer or by hand. If it is too thick, add more milk. If too runny, add more sifted powdered sugar. Cook's Note: Adding a lot more more milk than the recipe recommends makes the frosting spread on the cookies more easily. *Adapted from a Betty Crocker cookbook.